180 Degree Turn Time72 sec. Initial HE Shell Velocity731.5 m./s. Initial AP Shell Velocity731.5 m./s. Queen Elizabeth — British Tier VI battleship. An excellent design, the Queen Elizabeth class of battleships served with distinction through both world wars. They were, in many ways, the first modern battleships deployed by any navy. Tier VI's Queen Elizabeth is the last classical dreadnought of the British battleship line. 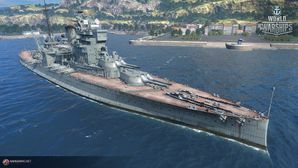 Players who own Tier VI premium Warspite — a Queen Elizabeth-class battleship — or are veterans of Tier VI German battleship Bayern will find Queen Elizabeth to be familiar territory. Queen Elizabeth possesses adequate speed for her tier, and has a solid armor belt married to hard-hitting, accurate guns with good firing angles. Her ability to overmatch the common bow armor of all existing battleships through Tier VII is a notable advantage. She does not suffer nearly as much from the need to plan based upon the battle situation as New Mexico, Arizona, or Fuso, though she does suffer from the same glacially slow turret traverse speed as predecessors Iron Duke and Orion. Her anti-aircraft suite is the best amongst Tier VI battleships, blowing past even that of New Mexico. Players will find Queen Elizabeth to be as dominant as Warspite in same-tier matches and entirely capable in mid-tier matches. While she can struggle as a bottom tier ship, she's no less capable than any other Tier VI battleship. Powerful guns with outstanding accuracy. Best anti-aircraft armament of all Tier VI battleships. Queen Elizabeth is somewhat unique as the preferred research priority depends very much on personal play style. There is no upgrade which provides an obvious advantage over the other choices. Players who prize maneuverability will want to research the engine upgrade first, those who prefer the ability to hit targets at range will choose the fire control system, and those who value anti-aircraft protection and survivability will choose the hull. Another option in Upgrade Slot 4 is Steering Gears Modification 2 ( ), for players who prefer increased rudder shift speed over maximizing Queen Elizabeth’s survivability. Priority for premium consumable use should be Damage Control Party II ( ), then Repair Party II ( ), and finally Spotting Aircraft II ( ). Players who wish to spend doubloons can equip Queen Elizabeth with Type 16 camouflage that lowers her detection radius, reduces the accuracy of incoming shells, reduces her repair costs, and increases the amount of experience she earns. Alternatively, the 2018 New Year raid campaign provided captains with the Snowy camouflage with the same bonuses as the premium. Economic signals are left to the discretion of the player. The following is a basic summary of all signals which provide a combat bonus. Queen Elizabeth sails into battle. A bow view of Queen Elizabeth as she trains her forward turrets to port. Queen Elizabeth taking several hits forward. Queen Elizabeth under fire from battleship guns. Queen Elizabeth firing a full broadside. The secondary battery of Queen Elizabeth opens fire. HMS Queen Elizabeth, Mediterranean, 1943. The Queen Elizabeth class was originally envisioned as an iterative improvement over the previous Iron Duke, but several previously untried principles were introduced. A top speed of 25 knots was specified, to be achieved by building the ships as the first entirely oil-fueled battleships in the world. The proposed 14-inch guns were to be replaced by 15-inch guns — a measure strongly supported by then-First Sea Lord Winston Churchill — to keep the Royal Navy both peerless and parlous. As designed and ordered, the Queen Elizabeth-class battleships would have two fewer guns than their predecessors, but a heavier broadside weight due to the use of the 15-inch guns. The removal of the mid-ship centerline turret simplified the arrangement of the engineering spaces while also allowing the ships to be completed with the modest approximate 2,000 ton increase over the Iron Duke class. Though the design speed was intended to be 25 knots, this was, in practice, never reached. The Queen Elizabeth class became a remarkably successful design, and served through both world wars. Subject to extensive modification during the interwar years, their appearance and capabilities changed radically over their service lives. Queen Elizabeth in particular saw her first modification when it was determined her secondary armament stations as designed were prone to being washed out even under normal conditions. Two of her 6-inch guns were removed, and two were re-sited to the boat deck in shielded mounts during 1915. All other ships of the class were then completed with this arrangement. She received an extra inch of armor over her main armored deck after the experience of Jutland, and in the early 1920s she was equipped with a flying-off platform on each of her A and X turrets for spotting or fighter aircraft, though she had no means of recovering them. Queen Elizabeth underwent her first major reconstruction from 1926 to 1927. Her funnels were trunked (combined), the flying-off platforms removed, and she received torpedo bulges. In 1937, she paid off for a second, even more extensive reconstruction. Her submerged torpedo tubes were removed, newer, more efficient engine machinery installed, and her main battery received and elevation increase to 30 degrees which increased effective range. Her superstructure was completely redesigned at this time, and the bridge fully enclosed. Her armament was further modified with all her 6-inch guns being landed, the casemates were plated over, and she received ten twin (10x2) QF Mark I and Mark III 4.5-inch high-angle, dual-purpose guns instead. Her deck armor was further augmented at this time. Queen Elizabeth received an ever-increasing number of anti-aircraft weapons over her service life, and by 1945 had over fifty 20mm guns installed. HMS Queen Elizabeth was sent to join the Mediterranean in late 1914. There she engaged in bombardment of Turkish positions as part of the preparation for the Gallipoli landings, but was withdrawn in May 1915 to rejoin the Grand Fleet. She served as fleet flagship for the remainder of the war, but was engaged in a refit and thus absent from the Battle of Jutland. She again resumed flagship duties for the Atlantic Fleet through 1924, when she transferred to the Mediterranean, again as fleet flagship until 1926, when she returned to England for refit. Upon completion, Queen Elizabeth rejoined the Mediterranean Fleet until 1937, when she returned to England for her second major refit. Queen Elizabeth completed her second refit in January 1941 and was attached to the Home Fleet until May, when she once again was sent to serve as flagship of the Mediterranean Fleet. She would spend the remainder of 1941 escorting convoys and covering the evacuation of Crete. In December 1941, Queen Elizabeth was anchored in Alexandria, Egypt when a large limpet mine placed on her bottom by Italian divers was detonated, causing severe flooding and sinking the ship to the harbor bottom, though her decks remained above water. Over the next few months, she was refloated and sailed for Norfolk Naval Yard in the United States for refit and repairs in late June 1942. Having completed repairs, Queen Elizabeth embarked for England in late June 1943, where she served with the Home Fleet until sent to the Indian Ocean in December, arriving in January 1944. Queen Elizabeth was made fleet flagship of the Pacific Fleet, and participated in the raids on Japanese targets in the Netherlands East Indies throughout 1944 and 1945, as well as joining the covering force which attacked targets in the Andaman Islands in support of the recapture of Rangoon in British Burma in 1945. In July 1945, Queen Elizabeth was replaced by Nelson and returned to Portsmouth, England that August. She was then placed in reserve and used as an accommodation ship until March 1948, when she was sold off for scrapping. Queen Elizabeth was broken up for scrap in July 1948. Queen Elizabeth is only shown in game after her major 1937-1940 rebuild, meaning her World War I and interwar period conditions are not represented. Queen Elizabeth is also not shown in 1943 to 1945 condition, where the catapult was removed and sixteen (16) dual 20mm Oerlikons were added. Hull (A) in game should have zero 20mm Oerlikons, not eight. Queen Elizabeth in the 1930s. With trunked funnels, circa 1936. HMS Queen Elizabeth in Alexandria harbour surrounded by anti-torpedo nets. German Rear Admiral Otto Maurer, leading the German delegation, boards Queen Elizabeth during the surrender of the High Seas fleet, 21 November 1918. An undated photo of Queen Elizabeth during World War II. Queen Elizabeth in her distinctive camouflage. This page was last modified on 19 February 2019, at 09:24.